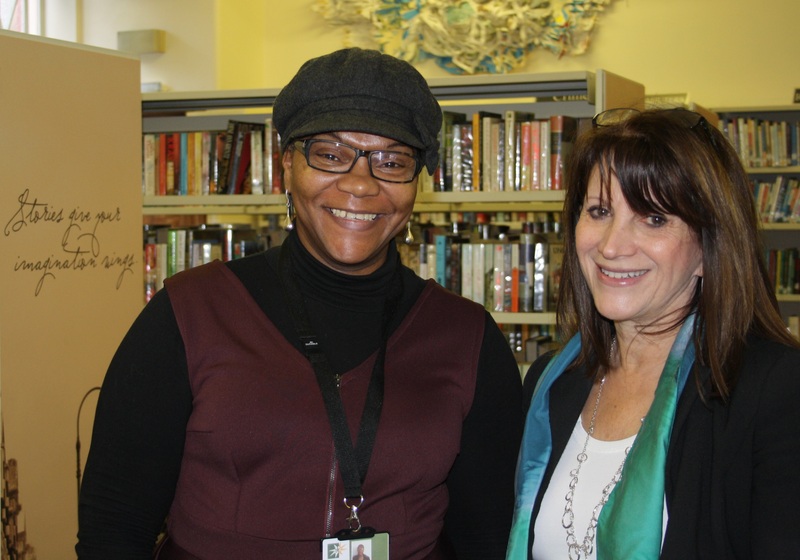 Lynne Featherstone MP last week visited Muswell Hill Library, to take a look at the facilities and to discuss the future of the library. The library, which has between 100 and 350 users per day, is now providing downloadable books, magazines and newspapers, as well as internet services and events for children. During the visit, a local resident and library user expressed support for the campaign, and told the MP how important the services are for her and others, particularly local children. The MP for Hornsey and Wood Green started a campaign to save the library late last year, after Labour-run Haringey Council’s budget plans revealed an intention to relocate the service. Almost 2000 residents have signed the Liberal Democrat MP’s petition, which calls on Labour-run Haringey Council to remove the proposed closure and relocation from their budget plans. “It was great to visit the library and see first-hand how valuable the services are to local residents – from young children taking part in activities, to elderly residents accessing newspapers and the internet. “Almost 2000 local residents have backed the campaign to keep the library services in the historic building on Queens Avenue. It would be much better to install a lift in the current building – which is the only thing it lacks – rather than undergo a full relocation. Lynne Featherstone MP and a Liberal Democrat councillor have challenged Labour’s plans to relocate Muswell Hill Library after Cllr Gail Engert uncovered an important legal document. The Lib Dems believe that the document means Labour plans to relocate the library, as revealed in the draft budget for Haringey Council, are not sound. Local MP Lynne Featherstone has been campaigning to save the library after it was revealed in the draft budget that Labour planned to close the library and move the service to an unspecified location. Ms Featherstone’s petition attracted 1318 signatures in just a few weeks. The opposition politicians believe that the newly revealed legal document means that any plans to use the library building for another purpose or to sell the site off could be open to legal challenge. “Under pressure from local Lib Dems and residents, some Labour councillors are already backtracking and saying that the library will remain where it is. Over 1300 residents have signed our petition, which shows just how much the service means to people locally. “James Edmondson donated the library land to the borough back in the 1890s with the clear intention it should be used for the public good. The site was first used as a fire station and later the wonderful listed building we see today was constructed to give the people of Muswell Hill access to books and learning. Lynne Featherstone and local Liberal Democrat councillors have launched a campaign to save Muswell Hill Library, an historic listed building. No alternative location for the library has so far been identified, raising fears that the library will close with no replacement in place. The Labour council’s draft budget only has vague references to alternative sites and suggests the library site could be used for development. Ms Featherstone is calling on the local community to support the Lib Dem campaign to keep the library on Queens Avenue open. She fought to save Muswell Hill Library from closure by Labour in the 1990’s and is determined to fight to save it again. “Budget papers show Haringey Labour’s clear intention to close Muswell Hill Library. And they haven’t given any assurance about where the replacement would be – leaving local residents very concerned about the future of the service. “Libraries play such an important role in local communities, providing space for people to meet, hosting community events and giving people access to books, newspapers, computers and more. “I am very worried that the council’s budget papers imply that Labour has plans to use the library for a development without giving a firm commitment to keep a local library service in Muswell Hill. Not good news about Muswell Hill Library – promised plans to refurbish Muswell Hill Library and provide vital disabled access that were due to take place this year have been postponed yet again by Haringey Council. “Muswell Hill Library is in a lamentable state with wallpaper hanging off the walls, toilets in an unacceptable condition and the top floor not accessible to disabled residents. Residents and local Liberal Democrat councillors have been campaigning for years to have this listed building returned to a fit state and accessible to all. More problems with the plans to redevelop / expand Muswell Hill Library as it turns out that the latest plans to sell off land at the back of the site to pay for the work … wouldn’t leave enough land left over for the library to expand after all! In other words – sell off land to pay for work that they can’t be done because, er… the land has been sold off. So very Labour Haringey!